I have many many food addictions! I just love Thai street food but sadly this isn't really available in Melbourne... yet. The closest I can find is the great array of ready made meals that are available in some of the Melbourne Thai grocers. 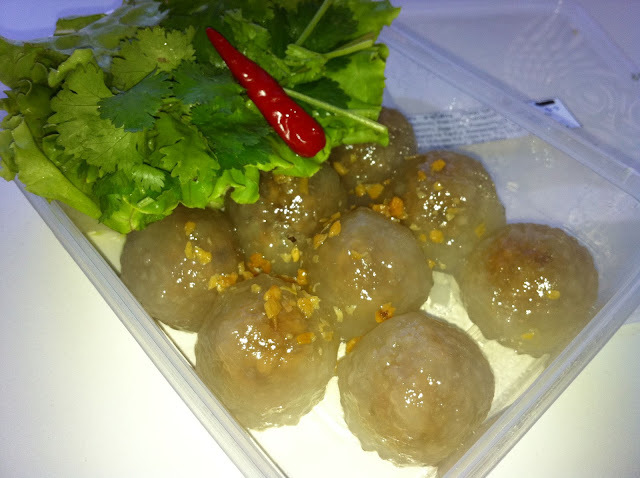 They are sold in plastic take away containers and are priced from around $4 to $10 for the larger ones. 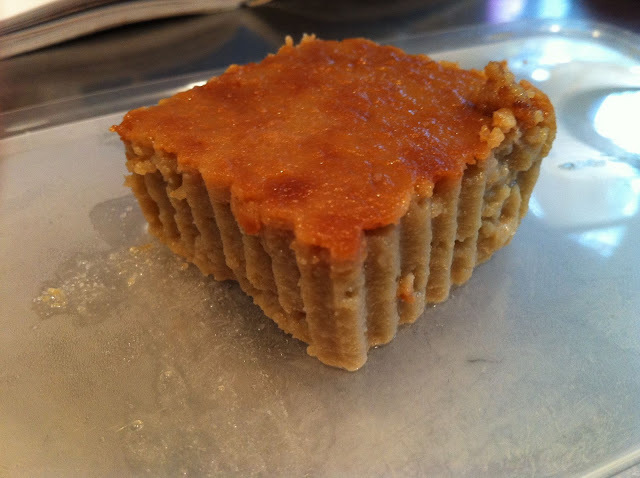 You can get savoury meals that you either eat as they are or take home and reheat or you can get amazing Thai desserts that you never see on any of the Thai restaurant menus. Sometimes I can't tell whether they are a savoury or a dessert! I can't go into these shops without leaving with at least one container of goodies. They are almost always delicious and there seems to be such a wonderful array of options with new ones appearing all the time. First up is one I bough at lunch the other day from one of the Victoria street Thai grocers. This one was Sago Sai Moo, It looks like a dessert and tastes somewhere in between sweet and savoury. 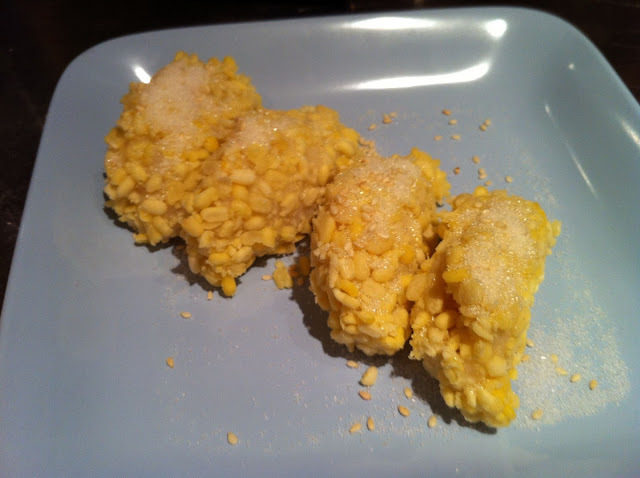 the savoury comes though in the nutty pork, onion and turnip filling and the sweetness from the delicious sugary sago outer layer. To eat, they are simply wrapped in a lettuce leaf with some coriander and then eaten whole in a single delicious mouthful. 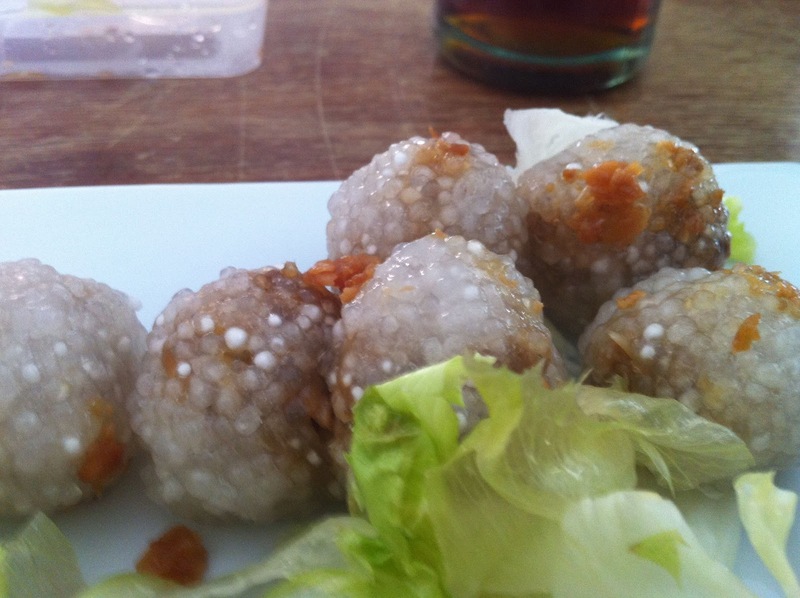 Sai Krok which is Issan pork sausage, these contain glutinous rice and are a great simple snack. I challenge anyone to stop at one. Sai Krok is another one of those Thai snacks that goes really well with a cold beer. Sa Kuu Sai Moo again, this is a different brand but equally delicious. The label on this one was Sa Kuu which I am assuming is phonetic Thai for Sago. Kanom Tokyo is a classic and one of our favourites. I find it very hard to not to keep going back to these and often have to convince myself to try something new rather stick with our usual favourites. The pandan custard filling is just divine. These Thai sticky rice pikelets didn't come with a label but I recognised them from David Thompson's Thai Street Food cookbook. I have cooked these at home and they were pretty good, not as good as these though. DT's book calls them Blaeng Jii Kao Niaw but I find his phonetic translations are far more complicated than those used on the internet and most other cookbooks. 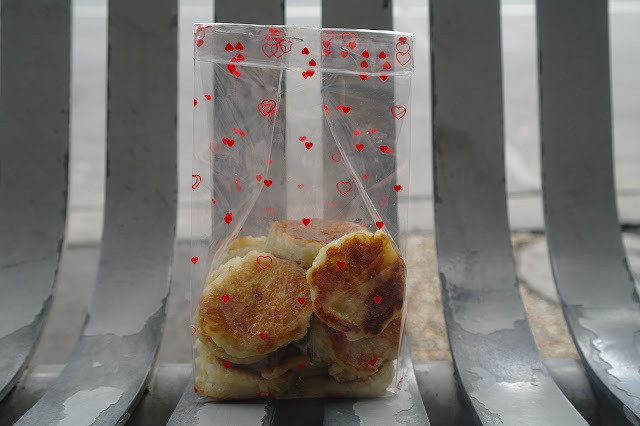 This one is Mor Gang and is made from coconut milk, egg and sugar. These were quickly devoured, they were delicious and strangely tasted similar to banana cake even though they contained no banana. 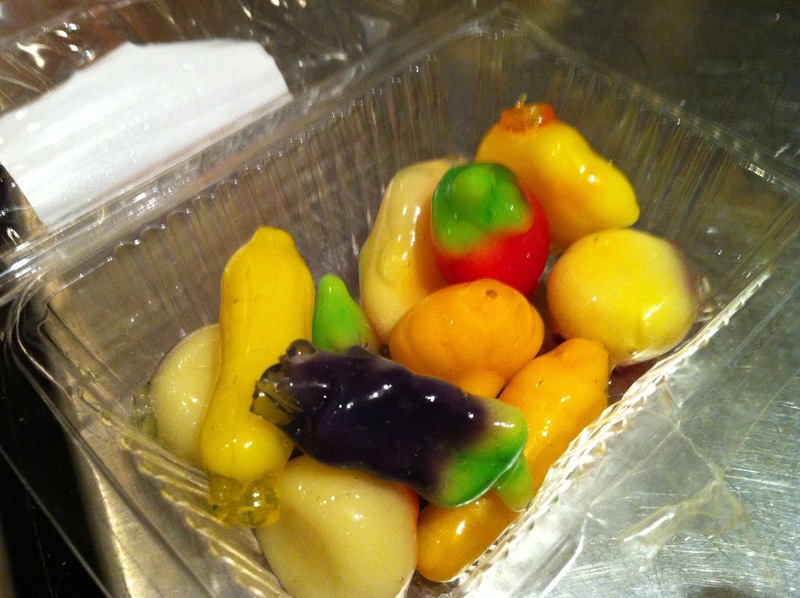 Look Chup is miniature fruit made with mung bean flour and painted with food colouring. They are so cute its hard not to buy them when you see them. They taste OK but I reckon its more about how good they look than the taste. 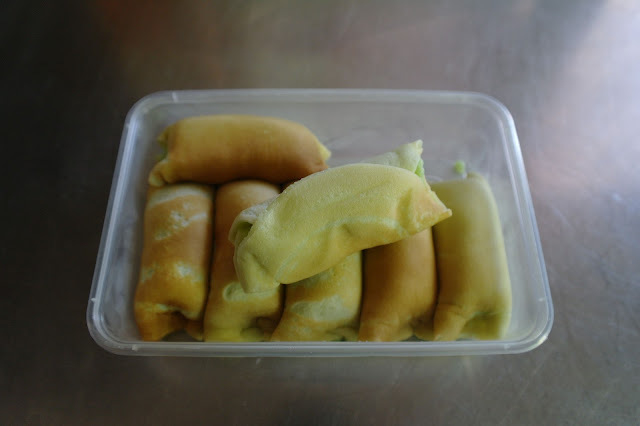 This one is Baan Nom Waan according to the label and it is made with mostly with rice flour and mung bean flour and sugar. We really didn't like this one and found it inedible. It was a bit of a shame as they looked good but tasted terrible. You win some and you lose some I guess. So sadly thats the end of the latest instalment of our Thai Video store snack adventures. If you see a Thai video store I really encourage you to have a look inside and see what they have on offer. If you find something great, please tell me about it! I've been reading your blog for a while now, it's great! I was wondering if you could let me know the names of these Thai grocers or their addresses? I've been wanting to get some Sai Oua and some of the fermented pork sausage as well (I forget its name). Cheers, Sophie. My favourite two Thai grocers are Nathan Thai in Footscray. and Thai Friend on Victoria Street Richmond. Check out these posts for pictures and a bit of information. The desserts are delivered on different days so its sometimes worth calling and asking when they come in. 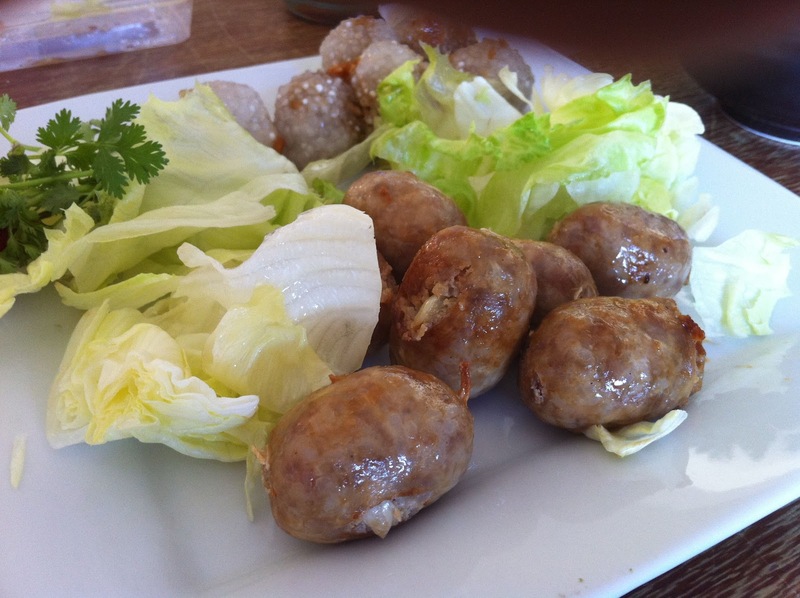 Lately Thai Friend has had the better selection and I have seen Sai Oua, Sai Krok and Naem (fermented pork sausage) there at different times. Also, Pok Pok in Docklands has great Sai Oua and I saw a sign (in Thai) on the window at Thai Culinary on Elizabeth street in the city advertising Sai Krok if you want an immediate fix. Hi Sophie, I was at Nathan Thai today and they have a new stockist who makes Sai Aua. They are called Tekade and have a facebook page if you want to look them up. I bought some and am eating it now, not too bad at all but I think I prefer the garlic punch of Sai Krok.